Warsaw has been one of the most important cities for Jews; before the Second World War there were half a million Jewish inhabitants in the city. POLIN, the Warsaw Museum for the History of Polish Jews, sits alongside the memorial to the Jewish Ghetto Uprising and tells the story of Polish Jews not only in the contents of the museum, but also in the public spaces and views to each other and the rest of the city that they create. Thousands of Jews were transported from the ghettos to death camps, the suppressed rose up and an entire city was decimated then rebuilt - POLIN now stands to tell these stories. The cavern through the heart of the building leaves room for interpretation by the visitor. Some may attach symbolism of the parting of the red sea, or the cracks in Jewish history. Regardless of what images get conjured up, the space creates a calm silence, a transition between outside life and the wealth of history contained within the museum. The space also visually connects the monument, the museum and the park. A certain silence surrounds the building; it is a monument not a landmark. It speaks of the time in which it was constructed, whilst also being the vessel for past and future stories of Polish Jews. Aside from its respectful relationship to its surroundings, the Museum of Polish Jews also boasts an impressive range of spaces and facilities which ensure the building’s relevance to the community today. 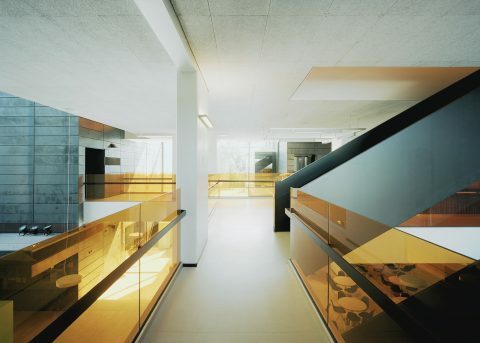 In addition to the museum POLIN also has office and educational facilities, a restaurant, library and areas for conservation and storing museum objects. 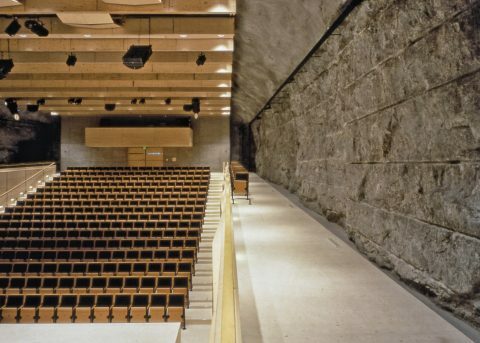 To top this off, the building also has a 500 person auditorium for concerts, lectures and performances of various kinds. Warsaw has been one of the most important cities for Jews; before the Second World War there were half a million Jewish inhabitants in the city. The park in which the museum now sits once formed the core of the Warsaw ghetto and a treasured memorial stands to remember the Warsaw Ghetto Uprising that occurred there. 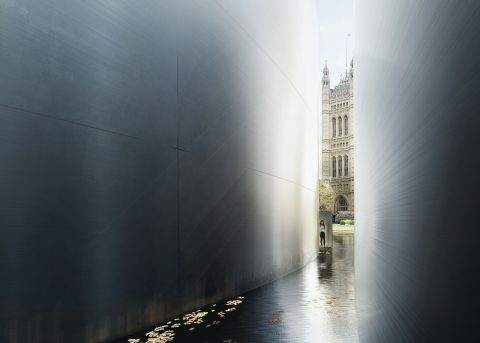 Polin works alongside this memorial to tell the story of Polish Jews not only in the contents of the museum, but also in the public spaces and views to eachother and the rest of the city that they create. 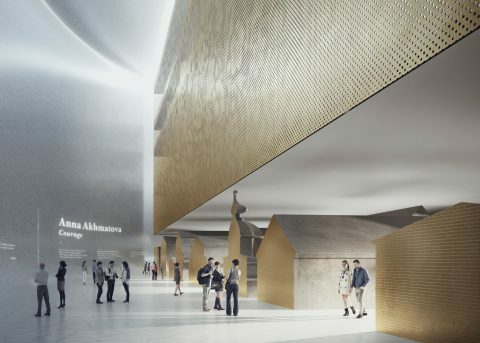 What Lahdelma & Mahlamäki Architect’s proposal brought to the international competition was a level of modesty – rather than creating a loud statement – that spoke of the time in which it was constructed, whilst also being the vessel for past and future stories of Polish Jews. The goal was to create a certain silence around the building, a monument not a landmark. The basic form of the building is compact and reserved, not detracting from or overshadowing the surrounding park. 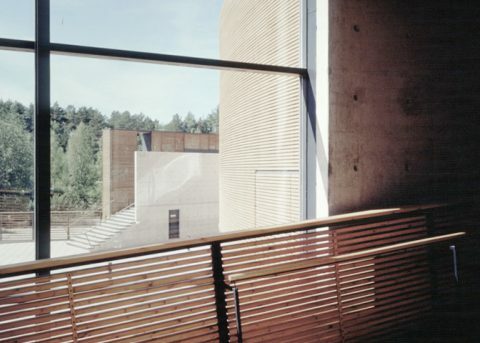 The competition jury stated in its evaluation that the concept had been realized “without unnecessary rhetoric, with simplicity and elegance”. From a distance the building envelope blends into its surrounding – dappling the light and reflections with its staggered panels. As one gets closer, the panels reveal clusters of letters – spelling POLIN in Latin and Hebrew letters. The word translated into English means ‘Poland’ or ‘rest here’. At the same time, cut right through the building is a soft, undulating gorge – connecting the monument to the Uprising, with the park and the city. In one sense the form looks to evoke ideas of the parting of the red sea and the cracks in Polish Jewish history. Whilst at the same time it’s meant to only suggest this and more allow the visitor to attach their own symbolism to it. Regardless of what one conjures up, the space creates a calm silence, a transition between outside life and the wealth of history contained within the museum. 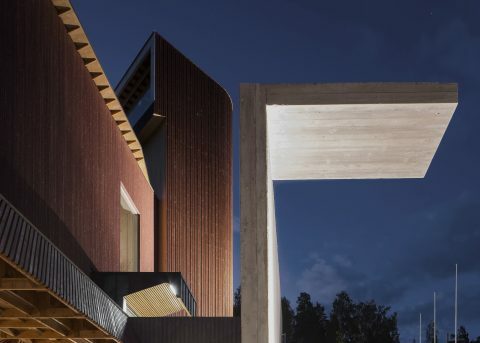 The double-curved walls inside are constructed from a load bearing steel frame sprayed with textured concrete – which adds stability to the whole system. The use of computer modelling software was crucial to creating such an intricate structural element which could translate an architectural idea so clearly. 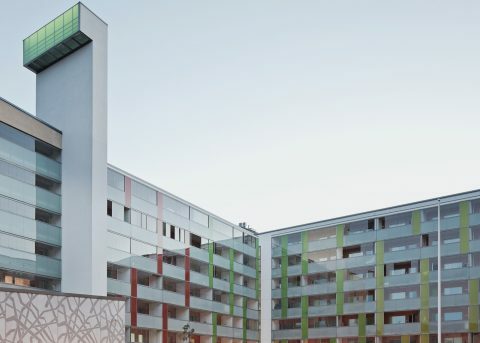 The end result of the façade coming together so cleanly is a testament to the successful interaction of cutting edge software alongside the tested experience of local contractors – collaboration with local architects Kuryłowicz & Associates and software developers Markus Wikar was also crucial. 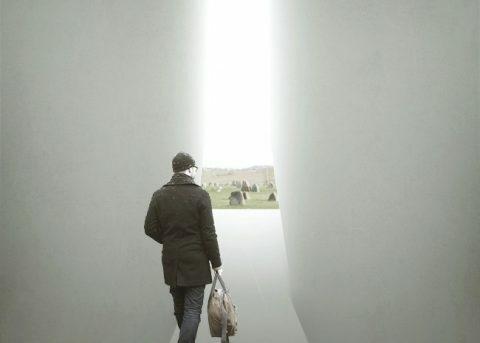 The walls themselves have been crafted from rough concrete into something more resembling soft sandstone – symbolising hope and beauty, whilst also reflecting the general tone of Warsaw. When the day’s light casts reflections and shadows through the exterior glass envelope onto the curved walls within, the inherent hardness of concrete evolves into a tranquil and gentle space for reflection. The massive spider-system glass wall on the western face of the building opens all this up and creates clear views through to the monument on the other side. 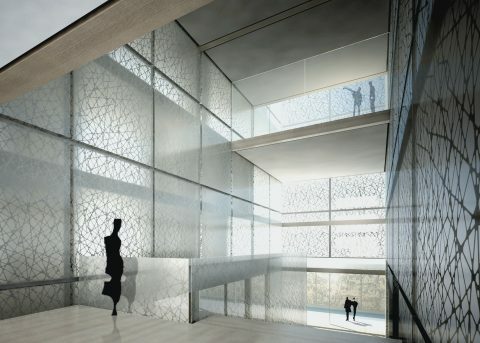 The museum building is a multifunctional centre for research, exhibition, education and culture relating to the Jewish heritage. The core exhibition area comprises almost five thousand square metres in area, beneath the main lobby. 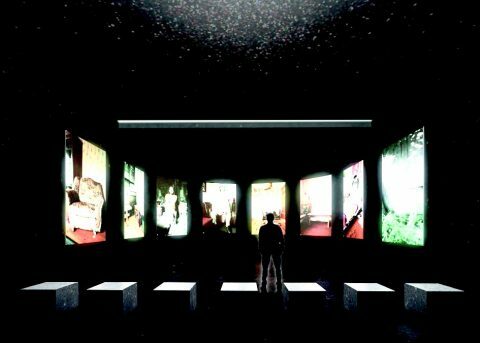 The exhibition presents the different forms and periods of Jewish culture from the Middle Ages until today– the holocaust is only one of the themes of the exhibition.